The 975-001 130-Series Anodized Aluminum Carrying Case from National Optical is a lightweight durable hard shell carrying case designed for 130-series microscopes (except dual head models). 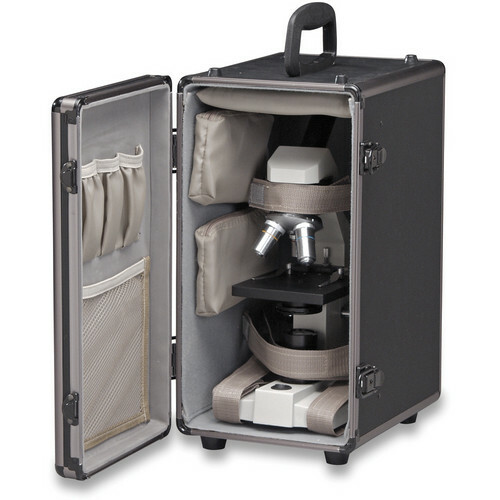 The anodized aluminum exterior, fabric liner, and keyed lock ensure that your optical instrument will remain protected from the elements and mishandling during transport. Accessory pockets and hook and loop straps on the interior of this carrying case make the unit convenient and travel-ready. Fits 130-series microscopes (excluding dual head models). Anodized aluminum exterior with fabric liner and keyed lock. Box Dimensions (LxWxH) 18.2 x 12.3 x 9.8"